This year’s Independence Day weekend was prefaced by the fiftieth anniversary of the Civil Rights Act of 1964, one of the seminal enactments of freedom for disenfranchised people of color in America. But while certain victories, such as the re-election of US Senator Thad Cochran of Mississippi, evidence flashes of agency for African-American voters, much of the South has colossally undermined the civil liberties granted to its under-caste half a century ago. The Reverend Jesse Jackson traced the consequences of the federal government’s shutdown in the fall of 2013 back to the early nineteenth century, stating, “This shutdown is also a showdown. Its roots run deep—all the way back to John Calhoun, to the Confederacy, to nullification.” While the state’s rights doctrine of nullification began with Southern states protesting federal tariffs in 1828, Calhoun and nullifiers connected the advancement of state’s rights with attempts to defend pro-slavery ideologies and preserve the disenfranchisement of African-Americans. 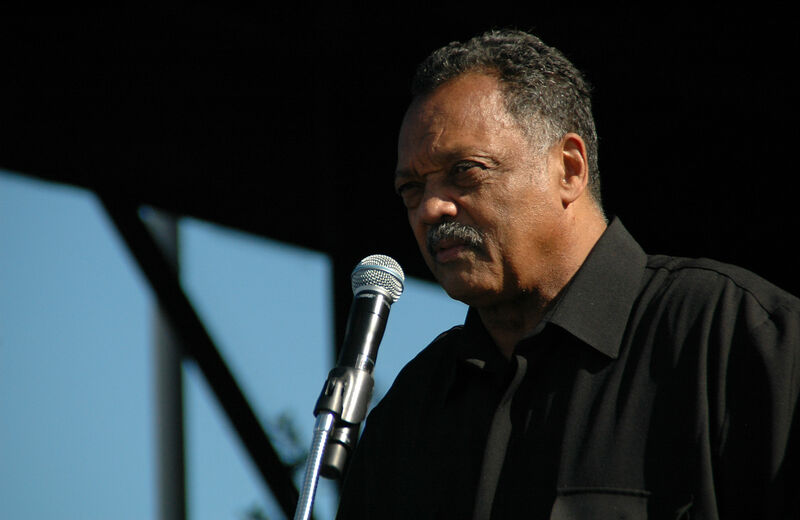 In his work as a civil rights strategist and organizer, Reverend Jackson has addressed many of these disenfranchisements, and did so during his presidential campaigns in both 1984 and 1988 by focusing his platforms on applying stricter enforcement of the Voting Rights Act of 1964, advocating ratification of the Equal Rights Amendment, establishing universal healthcare and calling for us to find “common ground” so America could move to an economic “higher ground” for all. That was thirty years ago. As of this past May, there are twenty states refusing to participate in the Medicaid expansion, twelve of which are below the Mason-Dixon line. In states like North Carolina, voting restrictions have disenfranchised large voting-eligible populations of people of color and youth by limiting early voting periods and requiring government photo identification. Jackson spoke with The Nation to discuss his notion of an “Old Confederacy” sinking its way back down South, and his plans for a counter-agenda. You’ve been quoted on social media platforms and in interviews saying that our nation is currently experiencing “the resurrection of the old Confederacy.” This is your working argument that articulates what you see taking place politically, economically, and socially in the new “New South.” Could you elaborate on this further and give some examples of how you’ve seen this manifesting itself over the past few years and today? Up until 1964, fifty years ago, people of color could not use public facilities—hotels, motels, parks, libraries. When Dr. King gave his 1963 speech on the Mall in Washington, from Texas to Florida to Maryland, we couldn’t use a single public toilet. Our money was kind of defeated—we could not spend it to buy ice cream at Howard Johnson’s, rent a room in the Holiday Inn. Those were the laws of racial segregation, racial apartheid. Then in 1965, we won the Voting Rights Act. And that became the game changer. Dr. King appealed to President Johnson, to support the efforts of the Voting Rights struggle, but there was a lot of hesitancy because the South was solidly Democratic—Jefferson Davis, Confederate Democrats. And it was a kind of Poor People’s Party, a working man’s party. And the Republicans were somewhat the elites. Johnson said, “If you get the Voting Rights Act, you lose the South for a generation.” When African-Americans started to use the right to vote, whites shifted—when Nixon and Reagan came south. They shifted in mass to the Republican Party. Those who were once called Southern segregationist Democrats—which now had dishonor attached to it—became Republican conservatives. They changed uniforms, they did not change their character nor their ideology. The reason we got the right to vote and got the end of public segregation was because the Supreme Court intervened in 1954 and made segregation illegal. Then Congress responded to our movement, and intervened in 1964 to implement the new legal status. The Voting Rights Act, by the way, was not just for blacks—blacks could not vote in the South, white women couldn’t serve on a jury, 18 years was old enough to serve in Vietnam but young people could not vote. You couldn’t vote on college campuses as a way of keeping the youth vote down. You could not vote bilingually. You couldn’t get a fair, proportional minority representation of convention delegates until 1988, when I ran for the presidency. So the civil rights freedom fighters democratized the electorate and expanded it, to make room for more people, but one reaction was white Democrats, Southern Democrats, became, en masse, Republicans. Their ideology was always basically anti-minority, anti-labor, anti–gender equality. And what happened, when the Virginia State Sentate went Republican recently, the headlines read, “Old Confederacy States become Solid GOP.” The manifestation of that is that they have an ideological line. For example, in each of those states there’s now an attack on the Voting Rights Act. This is right when the Supreme Court took “pre-clearance.” Section 4 is out. They left us the car, but took away the key. So in North Carolina, the Republicans are removing pre-sanctioned college campuses, another way of diluting the college vote. They’re also in many states across the South reducing the amount of days you can early vote, or use voter ID. Many people don’t have a driver’s license or a voter ID, so it makes it very difficult for them. A lot of people have to drive long distances, it affects them. In Texas, for example, you can use a gun registration card to register, but you can’t use a student ID card to register. In Greenville, South Carolina, my hometown, a popular region that’s growing, really growing, they voted to run something they call nonpartisan elections. Nonpartisan really means at-large. At-large means you run city-wide. When you run city-wide as opposed to districts, people who have less money, who are poorer and minority, are less able to compete and win. We’ve written a letter asking the federal government to intervene and not allow that, because this city is very multiracial and multicultural, and if you have an all-white city council, you’ll have a whole new set of political and polarizing problems. That’s across the South, the whole attack on voting. The second thing they’re attacking is Medicaid, uniformly, the Medicaid money set aside by the federal government. South Carolina, one-fourth of its people are poor. When you cut Medicaid, it means, first of all you are cutting $11 billion in ten years, you’re cutting jobs and you’re cutting rural hospitals. You’re affecting veterans and seniors and youth and poor people (working poor people, generally). Doctors don’t want to have Medicaid problems because they can’t get paid. And the federal government is offering this money and the South Carolina governor says, “We reject it.” So does the governor in Alabama, that’s another $11 billion, so does the governor in Georgia, another $9 billion, so does the governor in Texas, that’s $100 billion. This rejecting of so-called big government, federal money is inconsistent because in nine of these states, 40 percent-plus of their state budget is federal. They could not devise the next payroll without federal money—the highways, the digging of the tunnels is federal, the bridges are federal, the expanding of the docks for shipping is federal. And all of that is federal money. Hospitals are about two-thirds federal money and support systems. It was wrong for governors to block school doors fifty years ago, and it’s wrong for them to block healthcare doors today. But it’s a kind of states’ rights meanness to try to defeat President Obama’s affordable healthcare plan. It doesn’t make sense for most people. The other thing is the jail industrial complex. Most of these states now, they’re using privatized jails for two purposes: one, to disenfranchise voters, because once you’ve been to jail it’s more difficult to vote. And two, it’s a profit-making industry. So that, if you’re in jail “x” number of days, the Corrections Corporation of America gets paid. They must be guaranteed 90 percent occupancy. Jail becomes a daycare center or a homeless shelter for so many people. It’s a profit-making industry—jails are for profit. And so the growth of the jail industry and also in many places, the jail labor force, undermines the domestic labor force. For example, there’s a company in South Carolina, Williams Electric Company, where 1,200 workers are making $18 an hour. They’ve laid off 600 of those workers and replaced them with prisoners who are making 80 cents an hour. Forty cents of that goes to rent the jail cell. 40 cents goes to child support or to upkeep their medicines and extra food. And the state gets $4 an hour to use a jail/prison lease program for private corporations. That is a real extension of slavery. The last thing would be the abounding segregated boards of directors of public corporations, which tend to be without women, without people of color. The South is becoming solid in its racial appearance, and many people do not realize the price they’re paying by rejecting federal investment in the South. We recently ran an article with Reverend William Barber about the rise and need of a Third Reconstruction. When looking at these issues, would you also agree that our nation needs a Third Reconstruction? And if so, what is your counter-agenda? The first Reconstruction came after 246 years of legal slavery. It allowed for the ex-slaves to build colleges and real high schools, and allowed them to own land and buy banks and begin to build. That Reconstruction was brought to a halt by segregation. It ended it. And between 1865 and 1877 you had the First Reconstruction. And it kind of limped along until 1896, when we became officially segregated again. The Second Reconstruction was really led by the civil rights movement and the work of Dr. King crying out for social justice for all, along with President Lyndon Johnson and his Great Society’s economic opportunities. LBJ brought poverty down from 30 percent to about 18 percent (before he got sidetracked by the war in Vietnam), built public housing, passed Medicare and Medicaid, expanded food stamps, strengthened social security. All that came out of LBJ, who passed almost 200 pieces of social legislation, the most ever by any president ever, ever, ever, ever! But of course, we’ve now abandoned those programs for the most part, or attacked them. So the result is now you have these cities that were ripped off by the banks. Banks are using subprime lending, predatory lending, private mortgage investment. And the banks went down. We bailed the banks out, locked the victims of bank behavior out. So most cities now lie fallow, with abandoned houses, abandoned buildings, and vacant land. Because of “banksters,” bad bank behavior. So we need a new reconstruction. We need a development bank. The conventional banks will not lend money to build up torn-down areas. And to build infrastructure. But with long-term, low-interest banks—a development bank—you can begin to start the Third Reconstruction. In thinking about black politics, author Norman Kelley asserts that the nation needs a return to the original intent of the Rainbow Coalition, primarily by “develop[ing] an agenda driven, grassroots, voter mobilization politics.” The forty-third annual convention for the Rainbow Coalition just took place in Chicago, from June 28 until July 2. While there you focused specifically on a myriad of subjects concerning voting rights, students, women, workers, as well as athletes. Can you describe how this figures into your counter-agenda? We need equality and peace as opposed to inequality and war. Inequality costs and war costs. Equality will expand our opportunities. And peace is far more sane and livable than war. So one of my concerns at our convention was, we are free but not equal fifty years after the ’64 decision, which was celebrated July 2nd. We are free but not equal. The inequality abounds. The first night we had a major session on poverty and urban education. You have three tiers of education funding that are tax-based: the inner city and rural poor have one standard of education, those who are better off on the other side of town have a higher standard, and the suburban areas have an even better educational system. But the kids take the same exam and the results are different. That’s one focus. The second day we focused on the thirtieth anniversary of the Rainbow Crusade of 1984. Running for the president changed a lot of people’s perspective on what was possible. There’s a direct line between our 1984 campaign and President Barack Obama’s success in 2008. Among other reasons, building a massive coalition, we registered millions of young African-American voters. We changed the rules in 1988, so that you now become a delegate by proportionality, rather than by winner-take-all. Hillary Clinton won California, Ohio, Pennsylvania and New Jersey, and under the old rules would have been the nominee. But under the rules for democracy, Obama flourished, he became the winner. That was one of the results of our campaigns. So the people who ran it, people like Congresswoman Maxine Waters, came together for a kind of reunion, looking at the unfinished business. And we had an excellent session on the need to place the right to vote firmly in the Constitution. We strategized ways to build support for the constitutional amendment put forward in Congress by Representative Keith Ellison and Representative Mark Pocan. Our convention had a big focus on comprehensive immigration reform. Given what’s happening with the children coming across the border, now 47,000 since October, with two-thirds of our neighbors from Mexico and South and Central Latin American, we’ve got to address that issue differently. And what’s happening to the children in Nigeria? What’s happening to those in Haiti? Immigration reform has to be comprehensive—Latin America and Haiti, the Caribbean, Africa. And it must pass. We also focused on gender equality, equity and parenting. Women cannot buy bread cheaper than men. Not a meal cheaper, not a car cheaper, not gas cheaper. It is fundamentally unfair for women to work and not get paid according to work that they do. There is nothing that women cannot do. Women fly airplanes. Women are surgeons. Women are engineers. So we must debunk the myth that women should be paid lower for some reason, that is totally ungodly, so far as we are concerned. We put a lot of focus on education, student debt, we gave away 100 scholarships. Some of the youth have good minds, they just don’t have the money. Student loan debt is greater than credit card debt, and we are fighting for student loan debt forgiveness. We also honored the United Auto Workers for their historic work. We focused on mitigating the impact of housing and church foreclosures with ministers. We met with athletes to talk about “Life Beyond the Playing Field,” and we organized to open up Silicon Valley to all our people. As it concerns youth, especially black youth who are inheriting this “old Confederacy,” and who will also drive this new Third Reconstruction, how is your counter-agenda providing them agency? A lot of youth came to our convention because we put a lot of focus on protesting the rising cost of education. It simply costs too much for the returns. You leave school in debt without a guaranteed job. And the loans are unforgivable. We’re giving banks money at 0 percent and students money at 7 percent. That’s not fair. Students need to be part of helping us think through that issue. We’ve learned to survive apart. We must now learn to live together, in multiracial, multicultural settings. We must learn that lesson. We cannot survive apart and make it. We must learn that lesson. Victoria FordVictoria Ford is a 2014 Summer intern for The Nation. She has written for the Artsblog for Americans for the Arts. Her work has also appeared in Scholastic's Best Teen Writing 2011 and Jai-Alai #9. Follow her on Twitter @crown_vic_.